It’s a variety of lemon that is capable of growing to a much larger size. So, fruit harvested from the Nine Pound Lemon trees usually will grow to a whopping size of about nine pounds. In that video I chatted with one of The Land Pavilion’s scientists, Les (a.k.a. the ”Prince of Produce”), about how citrus and science combine in this unique fruit to entertain and educate guests on the “Living with the Land” boat ride attraction and in the “Behind the Seeds” backstage walking tour. And despite the giant size of the Nine Pound Lemons, I discovered they are quite tasty and yield a lot of juice. We’re back this week with some exciting news from The Land. The team at the attraction’s living laboratories recently harvested their largest lemon yet from the Nine Pound Lemon trees. This lemon weighed in at a whopping 15.05 pounds, a record for The Land and its experimental greenhouses. And, a second lemon harvested from the very same tree weighed 12 pounds. While they certainly outdistanced their descriptive name, these two Nine Pound Lemons quickly became citrus celebrities at The Land. 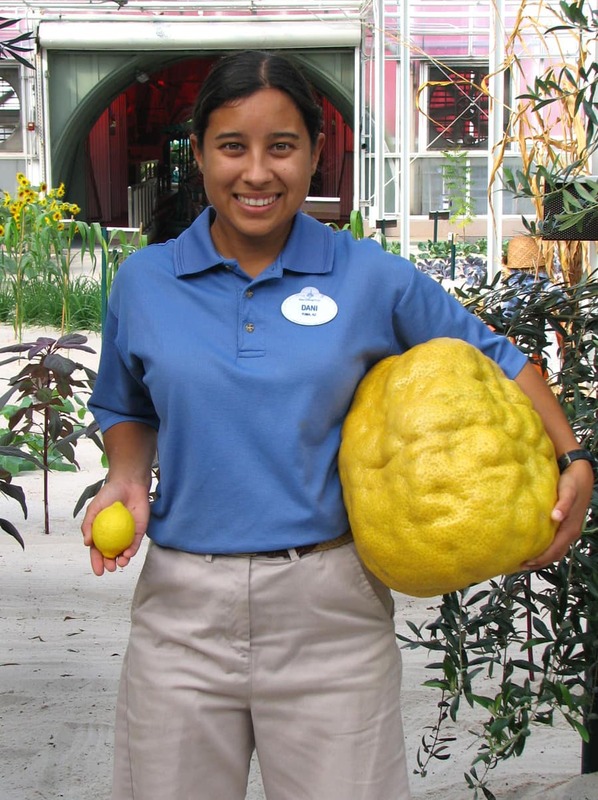 In the photo above, Dani, one of the Plant Science interns in charge of the greenhouse where the lemons grow, holds the 15+-pounder in one hand and a “normal-sized” lemon in the other. In fact, these two lemons even outweighed the “World’s Heaviest Lemon” currently listed on the Guinness World Records website. That pucker-producer, grown in 2003 on a farm in Kefar Zeitim, Israel, weighed in at 11 pounds, 9.7 ounces, which still stands as the official record. Let us know in the comments if you’ve seen the Nine Pound Lemon trees in the greenhouses or if you have another favorite part of the “Living with the Land” attraction and the “Behind the Seeds” backstage tour. I generally get to take the Behind The Seeds more than once a year; I find it mandatory for out of town relatives. And I do remember one time the tour guide was a biochemist who had worked at The Land for about 20 years. All of the guides for that tour are professionals as an “additional duty”. No, I don’t recall seeing them back in May (wish I had.) This is of my favorite attractions! The Behind the Seeds Tour is also fantastic! Wow that would look good in my Gin and Tonic!!!! Two weeks ago, went through The Land. How did I miss this lemon? Guess I was just too amazed at the other plants and vegetables! Definitely craving some lemon meringue pie right now. Also, I want that internship. I missed out on this one. After 40+ visits to WDW, I finally did the Behind The Seeds tour last year. I had had it on my WDW “to do” list for a very long time, but had never gotten around to it. It was a wonderful tour, full of lots of information (and I have a self-professed “black thumb”). On our visit next May, my son and his girlfriend plan on doing the Behind The Seeds tour. Her major is plant genetics, so I’m sure the tour will be very interesting to her. Wow! 40+ visits and you finally took the “Behind the Seeds” tour. 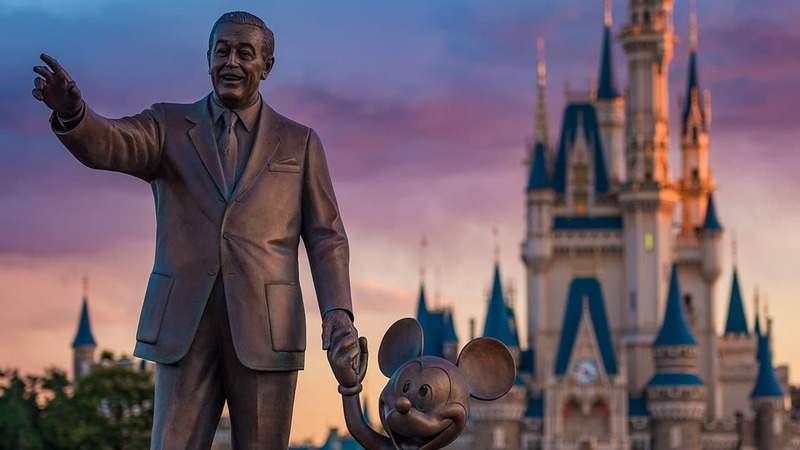 I am glad you were able to check that off your Disney Parks “bucket list.” Your son and his girlfriend are sure to love the tour as well, especially with her major. Beautiful! Is it possible to buy seeds from this lemon? wow that is sum lemon you got there. I hope you guys get the record for having the biggest lemon. I want to take the tour. It seems like it would be my favorite thing to do in Epcot. I did the Behind the Seeds tour last month. Even with my lack of green thumbs, I found it very interesting! Love both the Living with the Land boat ride and the Behind the Seeds tour! The ride is not one of the most popular attractions, so the lines are usually short and even if they aren’t, they move quickly. I also love the Hidden Mickeys that the talented Cast Members at The Land grow in the greenhouses. The “Behind the Seeds” tour is quite relaxing as well. How can one not be relaxed surrounded by nature and a lush, aqua environment? That was one of my favorite rides in Epcot. It was cool seeing all the different plants. I agree, Samantha and Kyra. The lemon trees and variety of plants from all over the world in the greenhouses make a visit to The Land a must-see when friends and family visit the area. I have seen the trees at least 4 times in the past month or so. I find them so amazing.